Total time spent traveling per capita has declined 8 percent in the past decade. The best source for reliable, recent, and aggregate statistics about time use for the US comes in the form of the American Time Use Survey. 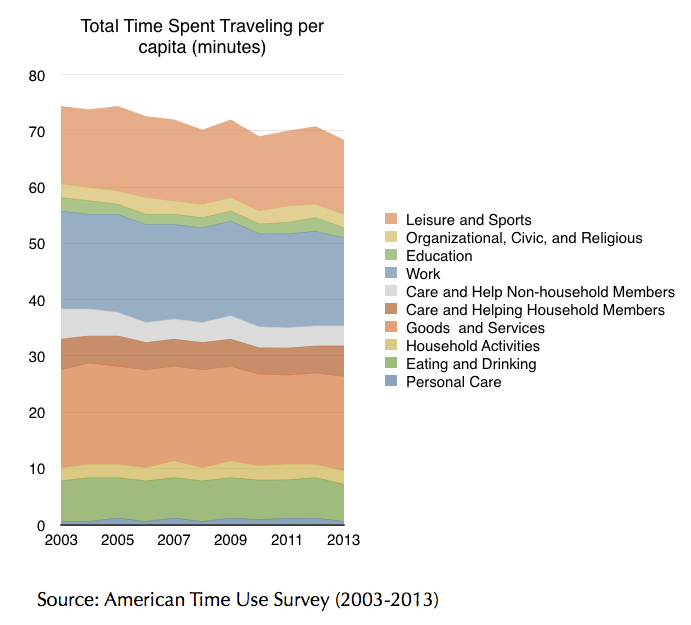 This data source, starting in 2003 and for every year thereafter, tallies the amount of time Americans spend in various activities, including travel by ten different purposes. Over the past decade, the amount of time spent in travel has declined six minutes: from 74.4 minutes to 68.4 minutes per day. How well does the survey capture walking time? Especially on short walks, people might include the walking time in the time spent at the destination rather than break it out as a separate activity.